Singapore is, to use a word its leaders favour, an “exceptional” place: the world’s only fully functioning city-state; a truly global hub for commerce, finance, shipping and travel; and the only one among the world’s richest countries never to have changed its ruling party. At a May Day rally this year, its prime minister, Lee Hsien Loong, asserted that “to survive you have to be exceptional.” This special report will examine different aspects of Singaporean exceptionalism and ask whether its survival really is under threat. 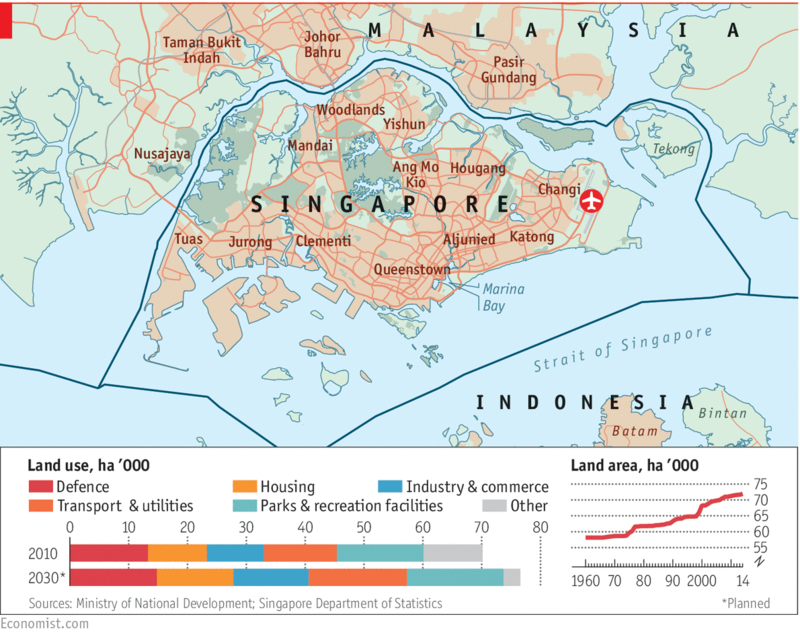 It will argue that Singapore is well placed to thrive, but that in its second half-century it will face threats very different from those it confronted at its unplanned, accidental birth 50 years ago. They will require very different responses. The biggest danger Singapore faces may be complacency—the belief that policies that have proved so successful for so long can help it negotiate a new world. In 1965 Singapore was forced to leave a short-lived federation with Malaysia, the country to its north, to which it is joined by a causeway and a bridge. Lee Kuan Yew, Lee Hsien Loong’s father, who became Singapore’s prime minister on its winning self-government from Britain in 1959, had always seen its future as part of Malaysia, leading his country into a federation with its neighbour in 1963. He had to lead it out again when Singapore was expelled in 1965. By then he had become convinced that Chinese-majority Singapore would always be at a disadvantage in a Malay-dominated polity. Mr Lee’s death in March this year, aged 91, drew tributes from around the world. But Mr Lee would have been prouder of the reaction in Singapore itself. Tens of thousands queued for hours in sultry heat or pouring rain to file past his casket in tribute. The turnout hinted at another miracle: that Singapore, a country that was never meant to be, made up of racially diverse immigrants—a Chinese majority (about 74%) with substantial minorities of Malays (13%) and Indians (9%)—had acquired a national identity. The crowds were not just mourning Mr Lee; they were celebrating an improbable patriotism. 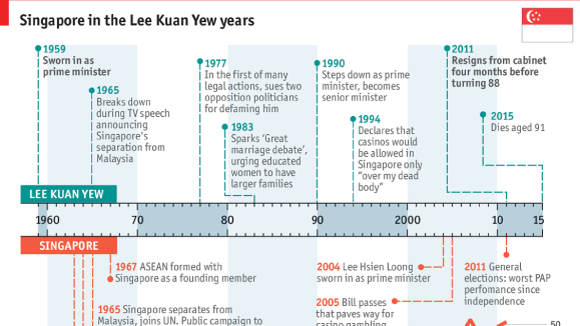 Lee Kuan Yew himself defined the Singapore exception. As prime minister until 1990, he built a political system in his image. In line with his maxim that “poetry is a luxury we cannot afford,” it was ruthlessly pragmatic, enabling him to rule almost as a (mostly) benevolent dictator. The colonial-era Internal Security Act helped crush opposition from the 1960s on. Parliament has been more of an echo-chamber than a check on executive power. No opposition candidate won a seat until 1981. The domestic press toes the government line; defamation suits have intimidated and sometimes bankrupted opposition politicians and hit the bottom line of the foreign press (including The Economist). Singapore, it is sometimes joked, is “Asia-lite”, at the geographical heart of the continent but without the chaos, the dirt, the undrinkable tap water and the gridlocked traffic. It has also been a “democracy-lite”, with all the forms of democratic competition but shorn of the unruly hubbub—and without the substance. Part of the “Singapore exception” is a system of one-party rule legitimised at the polls and, 56 years after Mr Lee’s People’s Action Party (PAP) took power, facing little immediate threat of losing it. The system has many defenders at home and abroad. Singapore has very little crime and virtually no official corruption. It ranks towards the top on most “human-development” indicators such as life expectancy, infant mortality and income per person. Its leaders hold themselves to high standards. But it is debatable whether the system Mr Lee built can survive in its present form. It faces two separate challenges. One is the lack of checks and balances in the shape of a strong political opposition. Under the influence of the incorruptible Lees and their colleagues, government remains clean, efficient and imaginative; but to ensure it stays that way, substantive democracy may be the best hope. Second, confidence in the PAP, as the most recent election in 2011 showed, has waned somewhat. The party has been damaged by two of its own successes. One is in education, where its much-admired schools, colleges and universities have produced a generation of highly educated, comfortably off global citizens who do not have much tolerance for the PAP’s mother-knows-best style of governance. In a jubilant annual rally to campaign for lesbian, gay, bisexual and transgender (LGBT) rights on June 13th, a crowd estimated at 28,000 showed its amused contempt for the illiberal social conservatism the PAP has enforced. Younger Singaporeans also chafe at censorship and are no longer so scared of the consequences of opposing the PAP. The PAP’s second success that has turned against it is a big rise in life expectancy, now among the world’s longest. This has swelled the numbers of the elderly, some of whom now feel that the PAP has broken a central promise it had made to them: that in return for being obliged to save a large part of their earnings, they would enjoy a carefree retirement. And it is not just old people who have begun to question PAP policies. Many Singaporeans are uncomfortable with a rapid influx of immigrants. These worries point to Singapore’s two biggest, and linked, problems: a shortage of space and a rapidly ageing population. From Third World to First: Singapore and the Asian Economic Boom (Harper Collins, 2000). One man’s view of the world (Straits Times Press, 2013). Kishore Mahbubani’s “Can Singapore survive?” (Straits Times Press, 2015) is a collection of articles covering many of the issues discussed in this report, in the author’s typically combative style. Also interesting is Koh Buck Song’s “Brand Singapore: How Nation-Branding built Asia’s leading global city (Marshall Cavendish, 2011). Highly recommended is the series of five lectures by Ho Kwon Ping on “The next fifty years”, given to mark SG50 at The Institute of Policy Studies, covering politics and governance, the economy and business, security and sustainability, demography and the family and society and identity. The texts are available on the IPS website. On Singapore’s investment in its near abroad, see; “Mirror images in different frames: Johor, the Riau islands and competition for investment from Singapore”, Francis E. Hutchinson (Institute of South-East Asian Studies, 2015). An excellent introduction to Singaporean politics, though now somewhat old, remains Cherian George’s “Singapore: The Air-Conditioned Nation: Essays on the politics of comfort and control 1990-2000” (Landmark Books, 2000). Mr George has also written an interesting examination of the role of the press in Singapore: “Freedom from the Press: Journalism and State Power in Singapore” (NUS Press, 2012). Also worth reading is the 2000 book “Self-censorship: Singapore’s shame” by James Gomez (Think Centre, 2000), and especially the foreword, by Philip Jeyaretnam, a leading lawyer and novelist, as well as son to J.B and brother to Kenneth. An excellent collection of essays is “Hard Choices: Challenging the Singapore Consensus”, edited by Donald Low and Sudhir Vadaketh, (NUS Press, 2014). CPF and HDB policies are explained on their websites. Tharman Shanmugaratnam’s interview at the St Gallen symposium in May is worth watching in full. A very useful survey of the available data and literature is the Lien Centre for Social Innovation’s report on “Unmet Social Needs in Singapore”. The lecture by Ho Kwon Ping is the fifth and final one in the series, on Society and Identity. The IMF figures come from the report on its most recent “Article IV” consultation with Singapore, published in October 2014. 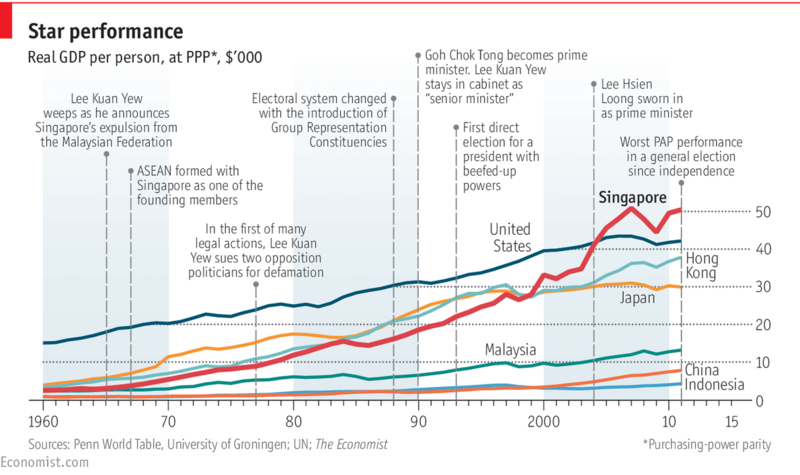 A useful article is “Singapore’s success: After the Miracle” By Linda Y.C. Lim in “Handbook of Emerging Economies” (Routledge 2014). A much older study, useful on the role of the state in Singapore’s early development is: The Political Economy of Singapore’s Industrialisation” by Garry Rodan (Macmillan, 1989). An “e-intensity index” including Singapore in in BCG’s “The Internet Economy in the G-20”. Commissioned by Google, PWC compiled a study on “Singapore’s tech-enabled startup ecosystem” (PWC, March 2015). The “Smart Nation” idea can be examined further. The figures on manufacturing and GDP come from the World Bank. On oil-refining in Singapore, Shell’s history is central. I am grateful to the EDB for an admirably clear and concise guide to the evolution of Singapore’s Hard Disk Drive industry. On its present-day ranking in port league tables. The classic study of Singapore’s foreign policy was published in 2000 by the late Michael Leifer, a British scholar, with an almost inevitable subtitle: “Singapore’s Foreign Policy: Coping with Vulnerability” (Routledge). For a succinct version of Singapore’s current world-view, see Lee Hsien Loong’s speechat this year’s Shangri-La Dialogue, an annual security forum held in Singapore. The defence budget.